One of the best aspects of teaching ESL to kindergarten and small children for me is the chance to be a little kid myself from time to time by becoming a scary monster! Having never really grown up, this ESL flashcard game for kindergarten is great for me and will suit fun TEFL kindergarten teachers, who enjoy playing around with kids in English lessons. In Angry Crab, the awesome flashcard game for kindergarten, you'll be a real sideways-walking angry crab with angry pincers snip-snapping away at the kids! Create lots of space in your kindergarten classroom and have all of your students standing at the back of the class. Pre-teach/review your chosen ESL flashcards until your kindergarten class is comfortable with the words. Now stand in the middle of the classroom and tell your kindergartners that behind you is a river which the kids must cross together. However there is an angry crab which doesn't like kids in his river and he will chase them away. The teacher is the crab! On your command, hold up a flashcard and the kids must shout out the word on the flashcard. Only then can they run across to the other side. The teacher moves side to side only (like a real crab) trying to catch those crossing! 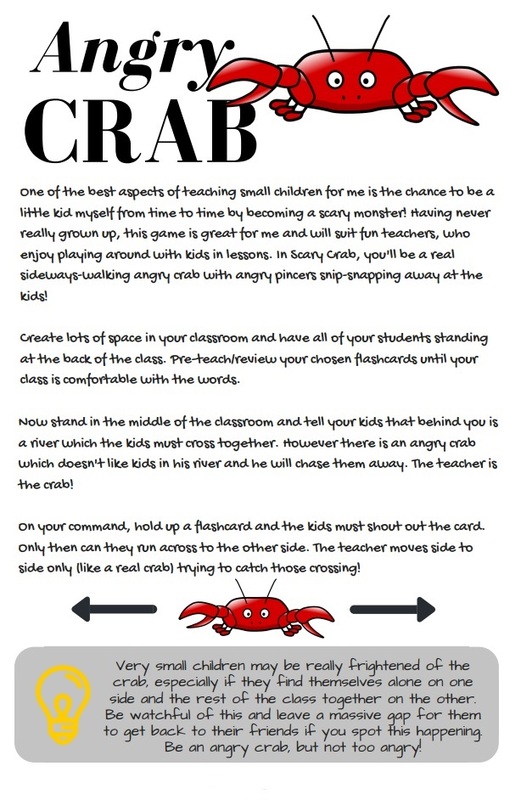 Teacher tip: Very small children may be really frightened of the crab, especially if they find themselves alone on one side and the rest of the class together on the other. Be watchful of this and leave a massive gap for them to get back to their friends if you spot this happening. Be an angry crab, but not too angry!